When you hit the brakes on your Mercedes Benz you hear a squeaking or grinding sound. A warning light is popping up on your dashboard. Your Mercedes Benz is not stopping as fast as it used to. Your brake pedal feels softer or harder than normal. If any of these symptoms describe your experience with your Mercedes Benz then chances are you need brake service. Our expert technicians have years of experiencing servicing and repairing Mercedes Benz brakes and are standing by waiting to help. There are a lot of intricate details in performing a proper Mercedes Benz Brake Service. Our certified and experienced technicians go the extra step in every service we perform. We only use the highest quality and factory specified brake part components and supplies. We also employ using the best techniques in servicing your Mercedes Benz brakes to get the most life out of them with trouble free enjoyment. We also have factory level scan tools to properly reset your Mercedes Benz service counter. We are so confident with our brake service that we offer a second to none 36 month / 36,000 mile warranty. At M-Spec Performance you get confidence and peace of mind in your Mercedes Benz Brake Service with us. If there is any defect in workmanship or parts we will perform the necessary repairs free of charge to you. Along with all of our brake service packages, we include our courtesy digital inspection. Normally a separate service charge, this is a full assessment from one of our ASE certified technicians on the condition of your entire vehicle. Pictures and explanations are logged onto a digital inspection format and is sent directly to our clients via e-mail. This is like getting a full checkup from the Mercedes Benz doctor! We are very confident you will be impressed by what you see. 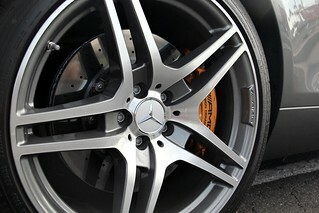 Do you need Brake Service performed on your Mercedes Benz today? M-Spec Performance is Queens, Brooklyn and Long Island’s leading Mercedes Benz specialty shop. We would love the opportunity to service your Mercedes Benz. Please give us a call or book an appointment here. We are waiting to meet you!